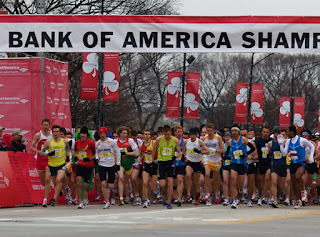 It's an annual tradition in Chicago to start off the running season with the Bank of America Shamrock Shuffle. With 36,000 spots available it's pretty difficult to turn down participating, unless you drag your feet like I did two years ago and miss registration by mere minutes (a press release hadn't even gone out yet announcing the race's closure). But those spots are going fast and it's expected that the race will close by the end of the week, if not earlier. According to an e-mail that went to past participants, less than 5,000 of the 36,000 spots remained as of this morning. I guess it's a sign that many Chicagoans want revenge over last year's slushy "Snow Shuffle"? I know I would...the only problem is that I'm already signed up for the March Madness Half Marathon (boo to them being scheduled for the same day, Shamrock was bumped up a week--most likely a result of Easter Sunday on April 4). But even I don't run in Shamrock--yep, I was one of last year's no-shows--the Nike T-shirt is a must-have that I'll be sorry to be passing up this year.